How will the Fluence ZE feel behind the wheel? With a bit of luck we’ll be driving the Renault Fluence ZE electric car in Paris in the coming week. We were wondering, in advance, how the Fluence might stack up against the Nissan Leaf (which we hope to drive later this year, having enjoyed a couple of brief stints in two Leaf mules). Although Leaf and Fluence share a similar battery, made up of identical flat-laminate cells, they use different motors in different bodies. Surprisingly, the purpose-built Japanese Leaf is almost 200kg heavier than its French frère, which has to manage with a bodyshell adapted for both fossil-fuel and electric drivetrains. The Leaf makes up for its lardier construction with a beefier motor, giving the two Alliance siblings identical power-to-weight ratios. The result is that the Fluence ZE and Leaf will probably feel similar to drive, but the Renault ought to have the edge in the real world. 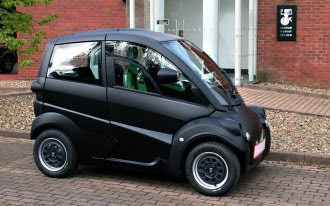 As maverick car designer Gordon Murray recently told Autocar, while talking up his T27 electric city car project, weight is the enemy of battery-powered cars – as is excessive oomph. “The last thing you want for an efficient electric car is conventional construction or a sports car character,” Murray told the magazine, arguing that heft begets more heft. “Weight or the need for lots of acceleration means your battery has to be too heavy.” And a heavy battery is of course also a pricey battery. It’s no surprise to learn that Murray’s upcoming T27 aims to be the lightest of proper (non-quadricycle) electric cars, although it may be a shock to see it trails most other EVs in power-to-weight ratio. The T27 will have fewer horses per kilo than even the family-sized Fluence. Murray’s electric midget will likely go round corners like it’s on rails, but away from the traffic lights it’s going to feel pretty sluggish.